“While Deoxys originally had little impact on the story of Generation III, Omega Ruby and Alpha Sapphire introduced the Delta Episode, a mission following the player’s first completion of the Hoenn League in which the player must stop a meteor from hitting the planet by destroying it with a befriended Rayquaza, revealing a Deoxys within. This marked the first time a Mythical Pokémon was available in-game without the need to attend an event or use a download code. 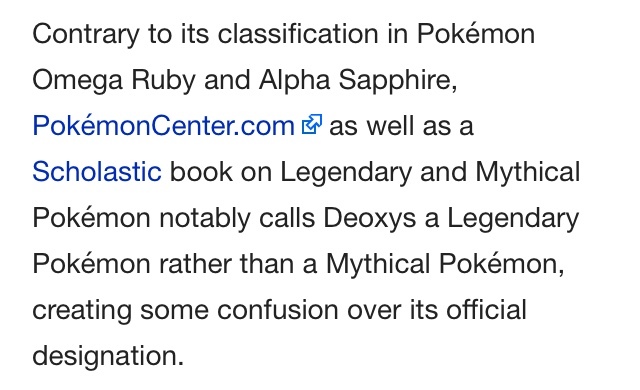 According to my son’s essential handbook, Deoxys is a mythical Pokemon. Anwser just one question: Why was it bammed in VGC 2016? Fine its not worth arguing. Nope, probably Jirachi will come first since it is in the dex first. Ya, also it might be some time as celebi will have a short period after it most likely. I know. And when seeing who liked your post I knew it would be @Necrozmadabest .